Testosterone (T2) is essential to creating muscle tissue in both men and women. But as mid-life lowers testosterone levels, muscle mass decreases. With NO change in eating and exercise habits, those over 40 may notice changes in body composition. Many men are horrified by newly drooping pecs and bulging bellies. Women often notice expanding waistlines and signs of “bingo wings.” And it all results from decreasing testosterone. Even worse, lower muscle mass also lowers metabolism, so 40+ bodies burn fat at a much slower rate. Not fair! Luckily, more strength training and less food are not the only way to keep your abdomen tight and biceps hard. Have your hormone levels checked and consider replenishing your testosterone through hormone replacement therapy. Beware of unsafe supplements, though; T2 is the most effective method of increasing T2 levels, especially when administered through injections or pellet implants. 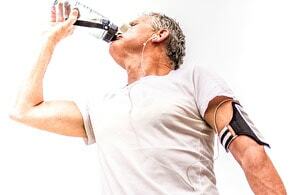 Remember, you don’t have to get flabby as you get older – work those muscles and restore your testosterone levels. Call Donna at 410-793-5212 today to schedule your free consultation and learn how hormones affect your whole body.